Boismortier: Simphonie pour l’arrivée des Génies Elémentaires (Les Voyages de l’Amour ); Premier ballet de Village, Op. 52; Sonata, Op. 14/3; Concerto a 5, Op. 37; Sonata a trois parties, Op. è37/4. Corrette: Concerto comique VI: ‘Le Plaisir des Dames’. Rebel: Les Caractères de la Danse; Sonate Sixiéme. Boismortier’s 1736 opéra-ballet, Les Voyages de l’Amour tells of the journey of Love in his quest to find a pure heart that will love him sincerely and without ulterior motive, having tired of making others happy without finding that happiness himself. Having searched through towns, villages and the royal court, he eventually finds his true love in the person of the shepherdess Daphné. In this glittering programme, Ensemble Meridiana take a similar journey through Baroque France in a musical search for that elusive true love, travelling through similar setting to those of Boismortier’s Amour, concluding with Michel Corrette’s ‘Amusing and Highly Entertaining’ wedding feast. 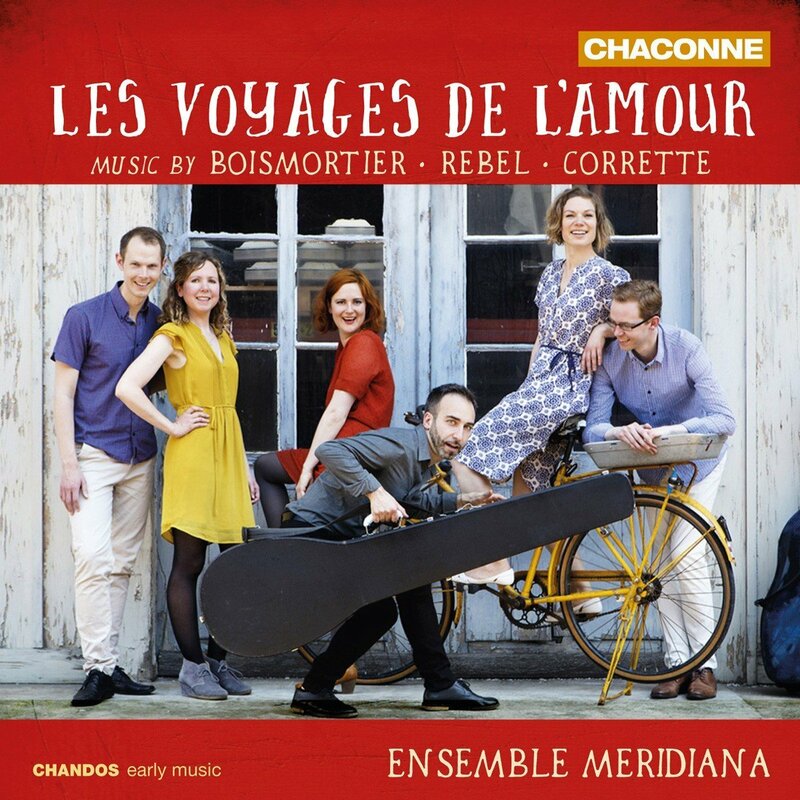 Boismortier’s music makes up the bulk of the CD, starting with the multi-sectional Simphonie pour l’arrivée des Génies Elémentaires, an extract from Les Voyages de l’Amour. Here the instruments are specified, but in many of the pieces the choice of instruments is left up to the performer, who also adjust some specified instrumentations to suit their own soloists and to provide balance within the recording. The wide range of musical influence on French music of the period is evident, from courtly dances to bucolic evocations of pastoral life. The multi award winning Ensemble Meridiana bring to their journey of love an extraordinary range of sounds, reflecting the wide-ranging instrumental skills of their six multi-talented musicians. The three solo players feature on six instruments, while the three-strong continuo team play seven instruments between them (Dominique Tinguely: recorders, voice flute, baroque bassoon; Sarah Humphrys: recorders, baroque oboe; Sabine Stoffer: baroque violin; Tore Eketorp: viola da gamba, quinton, violone; Christian Kjos: harpsichord; and Mirko Arnone: theorbo, baroque guitar, colascione). Dominique Tinguely’s well-written programme notes set out of the background of the music. She also has the lionesses share of the solo instruments, ranging from soprano recorder to bassoon. Together with Sarah Humphrys and Sabine Stoffer they relish the varied colours of their instruments, both alone and in imaginative combinations. The continuo team likewise produce sensitive and musically compelling accompaniments. Both technically and musically they all demonstrate a special talent. Whatever your own success, or otherwise, might be in that complex thing called love, you can safely sit back and leave these talented musicians to explore that world through some gorgeous music.